G160 - is a dual arm monitor stand by ONKRON and it is designed to fit most LCD LED monitors 13" to 27" and support up to 14.3 lbs per monitor. It is made from air-craft grade aluminum alloy material and steel, what makes this desk mount light and reliable. Due to the gas spring system you can easily move your displays in any direction. One of the newest features of G160 dual monitor mount is the ability to raise or lower the height of each monitor. 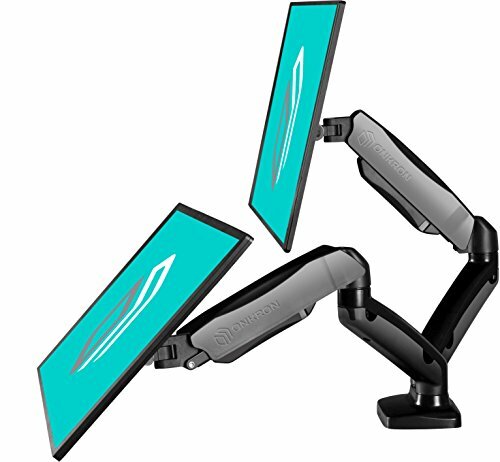 These full motion two monitor arms will give you freedom to place monitors in the most comfortable viewing position. Built-in Spring Gauge can be adjusted to suit various monitor weight. Thanks to the integrated cable management you can keep your power and AV cables clean and organized. The monitor mount is ideal for offices, classrooms, public areas or you can use it at home. This stylish and functional table mount will help you with your work twice as good, because the second monitor is a real advantage. 1. It is impossible to adjust the arms of the desk mount before complete installation. 2. Our Dual monitor mount fits two screens 13" to 27" in size 4.4 lbs to 14.3 lbs in weight each with VESA patterns 75x75mm or 100x100mm. 3. The diameter desk thickness must be between 0.39 - 3.3 inch. Step 1:Choose the way you want to install Arm Desk Mount: Grommet or Clamp. Step 2: Measure your desk thickness or the diameter of the hole in your desk and install the desk mount. Step 3: Measure your monitor VESA pattern, choose the right set, screw the upper position in two holes, leave some space and hang up to the mount, tighten those two screws then the last two. Step 4: Gently push a little bit down your TV or computer monitor, adjust the arm tension by using the included wrench until your TV stays wherever you leave it. Turn the wrench clockwise or counter-clockwise to adjust gas spring tension.